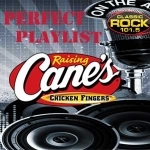 Now you can enjoy a box combo meal from Raising Cane’s, wile you listen to your favorite music with The Perfect Playlist hosted by Jim Cartwright on Classic Rock 101.5. Every Weekday starting at 3 we ask our listeners to send in their “Perfect” three song playlist. We pick the best one and roll it non-stop between 4-5pm with that day’s Perfect Playlist author getting a box combo meal from Raising Canes. Just fill out the form below and send Cartwright your playlist. Then listen each weekday between 4pm and 5pm to see if your the winner!